Ready? 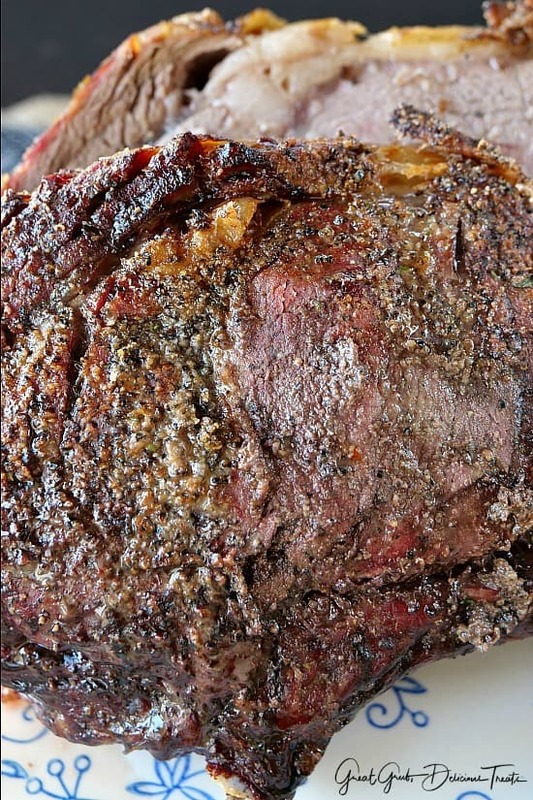 Ready to cook a perfect rib eye roast? I don’t make these too often, mainly because it’s a very expensive cut of beef and secondly, I’ve always been leery of ruining such an expensive piece of meat. However, this recipe turned out perfect. 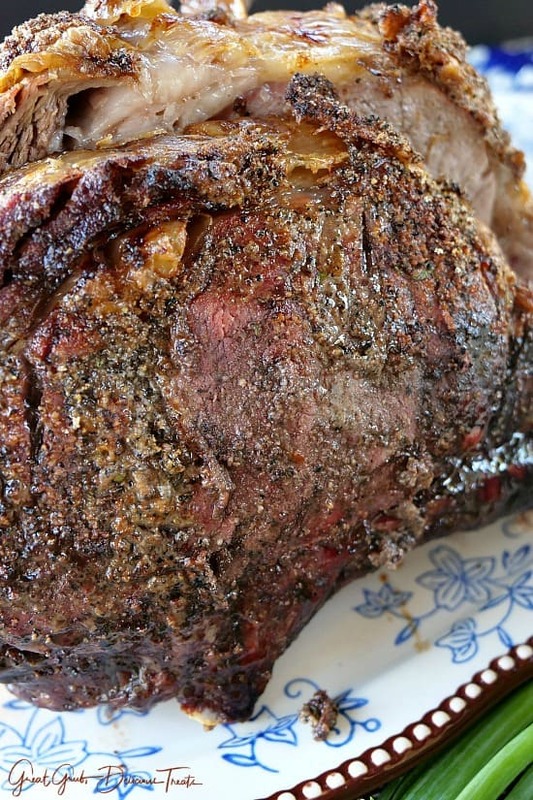 Last year we had a rib eye roast for Christmas dinner and only two of us ate it, my son-in-law and myself. It was too rare for the rest of the family and although very tasty, we did have to stick it back in the oven and cook it longer once dinner was on the table and everyone was eating. Very frustrating when the temperature was exactly what I wanted it to be and then having to wait while it cooked longer. Well…. this rib eye roast turned out perfect. 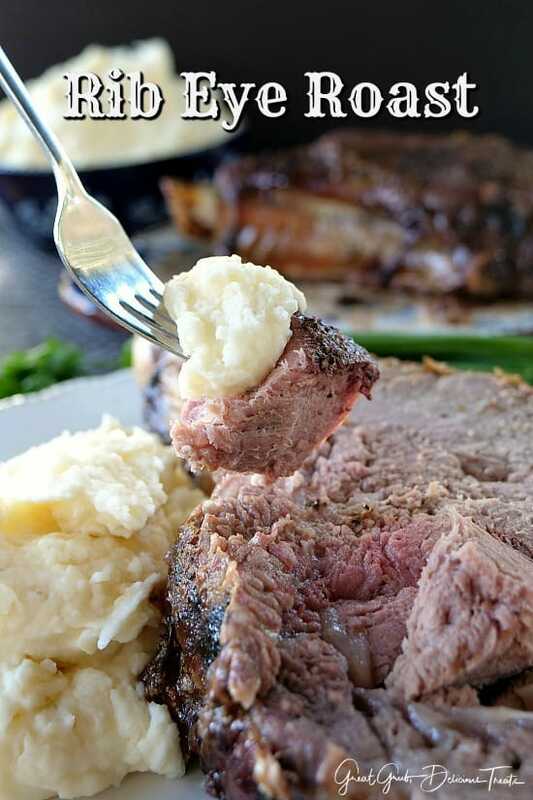 Basically, I cooked this rib eye roast for 30 minutes on 475° and then lowered the temperature to 325° and continued cooking for an hour and a half. Next, I turned off the oven and let it sit in the oven for another hour and a half, then turn the oven back on to 325° and cook for an additional 30 minutes. That’s it! In my household, we have one person (my boyfriend) who likes his meat well done and one (me) who likes my meat medium rare to medium. So needless to say when I cut into this choice piece of meat, I was soooo happy. Still pink enough to enjoy yet done enough for my man. Yep, perfect. 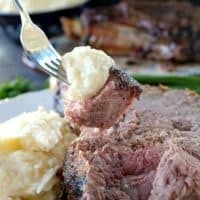 I hadn’t planned on cooking this rib eye roast yet but I asked my guy to take both chicken and beef out of the freezer so I could get a couple of recipes made over the weekend. When I came home from work Friday night and saw I was going to be cooking a bone-in rib eye roast, I decided I better not waste it. This is such a tasty, tender choice of beef. 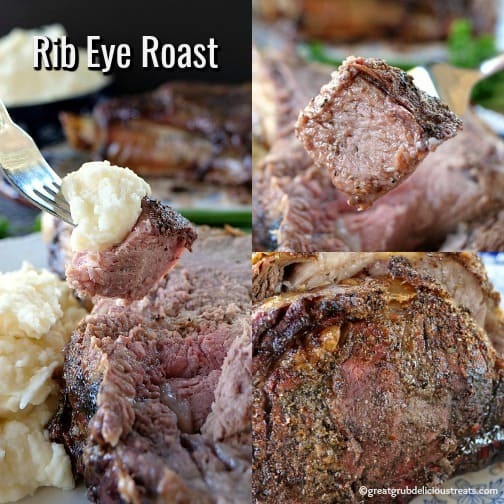 Rib eye roasts are definitely delicious! 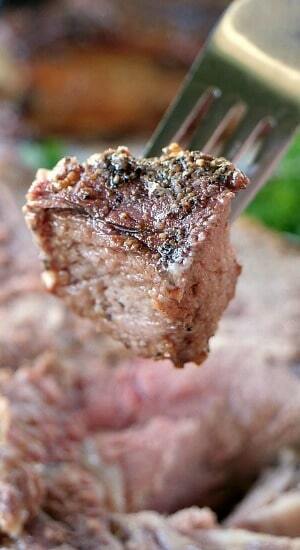 Just rub salt, pepper and garlic salt all over the roast, place it in a cast iron skillet and cook until done. YUM! Just a word of caution… be extremely careful removing the skillet from the oven and putting it back in with the roast. I grabbed the handle and the side of the skillet with pot holders and because of the awkwardness of the roast, it tipped, and my hand slipped and was resting on the skillet handle. I couldn’t do anything except scream and try to get the roast back in the oven otherwise it would have landed on the floor. So needless to say, I have a nice size blister on the side on my hand. Geez, that was painful! So please be careful. This rib eye roast was more on the medium well side. Still tasted amazingly tender and delicious! Here are some internal temperatures you’ll want to follow when cooking beef. 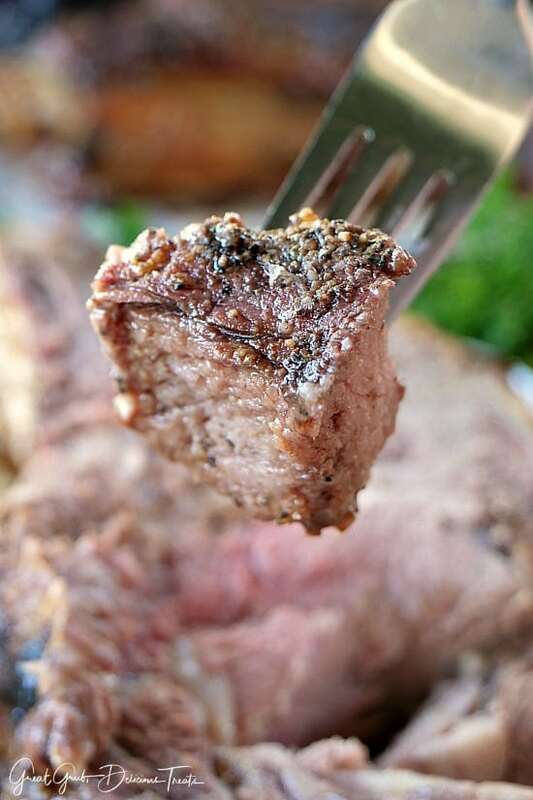 Rare = 125°, medium rare = 130­°-135°, Medium = 140°-145°, medium well = 150°-155°. 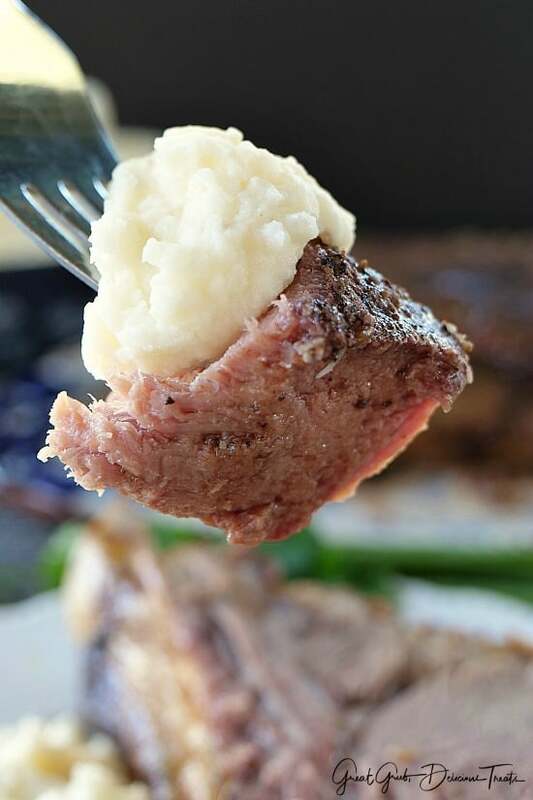 Here are a few more delicious beef recipes you can find on the blog: Crock Pot BBQ Beef Brisket, BBQ Meatloaf, and Green Pepper Steak plus many more. Let roast sit out at room temperature for an hour prior to cooking. While oven and skillet are preheating, whisk together, salt, pepper and garlic salt in a small bowl, then rub all over roast. Carefully remove skillet from the oven once 475° is reach. 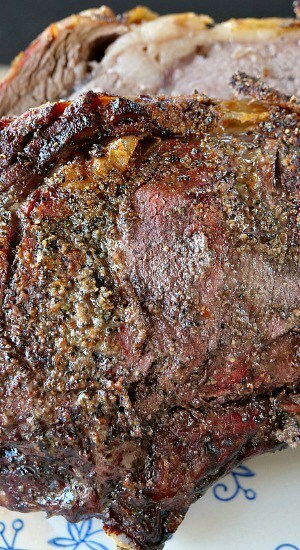 Place rib eye roast in skillet, fat side up, and carefully place back in the oven. Do not cover. Cook for 30 minutes on 475° then lower the temperature to 325° and cook for 1 1/2 hours. Turn oven off but leave roast sit in the oven for 1 1/2 hours. Do NOT open the oven door. After the hour and a half, turn oven back on to 325° and continue cooking for about 30 minutes. Remove from oven, let rest for about 15 minutes then enjoy!